James Franco is the latest celeb to guest star on the web-based series. Brian Sacca and Peter Karinen's "Fact Checkers Unit" uncovers a new truth: the web is creating hit shows. Debuting as a 2008 short film starring a pair of celebrity tabloid fact checkers who must verify Bill Murray’s proclivities for milk (aided significantly by an appearance by Murray himself), “FCU” quickly garnered a devoted following. The film morphed into an ongoing web-series sponsored by Samsung (who’s devices prove indispensable in the quest for celebrity facts) and features a revolving guest cast of bold-faced names. The most recent installment, “James Franco Is Preggers,” features the Oscar-nominated, multitasking actor in an expectant mode. 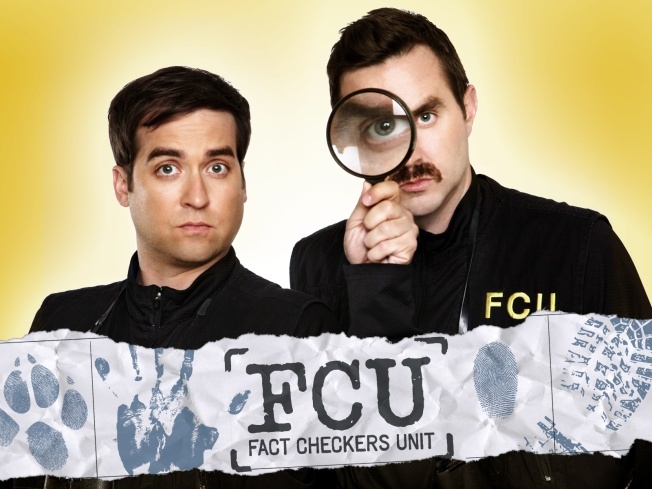 Writer/executive producer Brian Sacca, who stars in the series alongside fellow writer/executive producer Peter Karinen and executive producer Tom Bannister verified the facts behind “Fact Checkers Unit’s” for PopcornBiz. This little web project turned into something very big. Has it exceeded your expectations? Brian Sacca: We knew something was going to happen with it. We knew that having Bill Murray in a short film was going to create work. We didn't necessarily know that it was going to create a branded web-series that was going to last for a number of episodes, but we're all ecstatic about that. We've gotten to meet such awesome talent and work with amazing people that it couldn't have worked out better. Tom Bannister: Definitely Murray doing the original short is a crucial element for people wanting to do it. Even so, wrangling the celebrities, even just scheduling the celebrities – I think going back to Season One, it was a 12-day shoot and we had nine different celebrities, so fitting those nine different celebrities into 14 straight days with two rest days was just difficult to schedule, then we had to fly in Karolina Kurkova from New York….So yeah, that's definitely one of the challenges of "Fact Checkers Unit," the celebrities. It's also one of the unique elements of the experience, and certainly in a strange way, we've enjoyed doing and working with all of those people. Bill Murray is hard enough to get for a full movie. How did you land him for the original short? Sacca: We were lucky in the fact that the co-writer, Dan Beers, who also directs the episodes, worked on 'The Life Aquatic' with Wes Anderson. On 'Life Aquatic' he met Bill and they became chums. Still, even if you're chums with Bill he's not the easiest guy to get a hold of, but basically Dan told him about the idea. Bill was like, 'Oh, okay.' Then he faxed him the script – because Bill has a fax machine – and left him a number on Bill's 800 number where you leave messages. Then he saw him at a party a couple of months later, and Dan was like, 'Should I mention it? Should I not mention it?' So they had a little conversation and as he was walking away, Bill just goes, 'Oh, hey, Dan, that thing that you sent me: "Fact Checkers" – it's funny. Okay, I'll do it.' That was it, and Dan was like, 'Oh my God, we got Bill Murray.' So it was one of those things that I don't think any of us believed until they showed up on set that day. James Franco Takes On "Planet Of The Apes"
James Franco talks about what drew him to his new movie, "Rise of the Planet of the Apes." So, why was he skeptical at first? How many of the celebrities you've featured came to you and how many did you go after? Bannister: Season One was more actors, and in some cases there were relationships. We had a relationship with Pauley Perette, and Kristin Schaal, obviously from the short, and a few other people. We tried to mix it up a little bit in Season One so that it's mostly actors, but then you've got Karolina Kurkova who's a model. You've got Dave Navarro who's a musician. In Season Two, because it was distributed through MTV, we wanted to do music celebrities. So, we really, really tried to go specifically after music celebrities. So we had Moby, T-Pain, Run DMC, Sugar Ray, Kyle Gass, and then in Season Three we just kind of really wanted A-list celebrities. We thought that James Franco would be great. We took a shot and it worked out. Sacca: It's working with talent who are kind of looking to step out of what they normally do. It's being able to work with people like Alex Trebek and say, 'Okay, what would be fun to do with Trebek?' In that episode, for example, we were like, 'He's the father of facts. We want to do some sort of training montage. Then he came back and said, 'Well, if we're going to do that, I want to dress up as a Tibetan monk.' We said, 'Okay – obviously Trebek is game to have fun.' When he was on set cracking jokes the whole time he was down to just kind of have fun with the character that we all know him as and kind of what he wants to portray in the series. The James Franco episode is perhaps the funniest yet. Can you give me the background on that particular episode? Bannister: We wanted to do a one-off, kind of standalone episode. Season Two had been launched in December, but the sponsor, Samsung, weren't launching the phone in the U.S. until April or May. So we wanted to do a bonus episode almost: a big celebrity episode. Once we got that, I think it was really designing it for James. The way that Pete, Dan and Brian write the episodes, we kind of half-come up with the idea, and then they kind of half-fit it to the celebrities. Sacca: As the series has been progressing we wanted to step a little bit more out of reality, not be stuck within the confines of the natural world. Pete and I were talking about it, like, 'What could be a fun way to really step into new territory.' We were throwing the shape shifter idea back and forth, like, 'That could be really fun.' We hadn't really scene a lot of shape shifter comedy, I guess you could say, out there. We thought it would be a really fun way to comment on Franco's ability to do so many things as a performer. So we just kind of made a list of things that we'd want him to shape shift into and then based the episode around that. Is there a new season in the works? Bannister: We hope so. We're waiting to see how this latest episode goes. It's past a million views at the moment. We're certainly going to pitch some for the new season, and there's a bunch of celebrities who we think are interested in doing it. So, we're hoping that Samsung will sponsor a new season, fingers crossed.